1. Review concepts at the end of the day if there is a few minutes left. 2. Have a student leader come up and call out different concepts and have the rest of the class give the correct response. 3. Call out a coordinate and have students give the definition of that concept. 4. Compare and contrast two Power Pix. 5. Have students give examples for all the Power Pix. Can you think of more? I'd love to hear them!!! 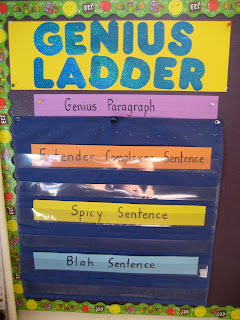 Tried out the Genius Ladder orally these last couple of days. Here is the example my kids came up with. They were tickled pink by it!! Blah Sentence: Here is a school. Spicy Sentence: Here is a castle school made of pizza. Extender Complexor: Here is a castle school made of pizza where students get hot lunch and a pepsi every day!! Super Improver Wall is ticking along! Kids love it and almost every kid is on to the next level! Oh yeah! The Scoreboard fun continues. Right now I am using Booyah for Smilies and No Treats for You for Frownies. For Class/Yes! I am saying Boo! Class, Meow Class, and Trick or Treat Class. Practice Cards are in effect and working well! Next week I am going to start using the student leader buttons! I'm excited!!! Happy Whole Brain Teaching!!!!! Wow - this week and last week have been a bit trying. Finally, I stopped to think at lunchtime today. Last year was exactly as crazy at the beginning. It took some time for things to settle down. Classroom dynamics change and mellow after September. I keep reminding myself to be patient - remain consistent with WBT and it will pay off. I was rewarded somewhat today when my students started to do my reminding for me. One student piped up, "Please STOP, Bobby* - I want Center time!!" I was able to step back and quietly watch as my students kept the independents in check. The Scoreboard buy-in is beginning to take effect!!!! 1. Whole Brain Teaching is still so amazing! 3. Scoreboard has had about 30-40 smilies and frownies on both sides before recess. The class has won the Scoreboard several times and they have lost several times, as well. 4. I have still had private talks with students on occasion just to reinforce that when they break the rules they are causing frownies for the class, especially if they are being unsafe. 5. I have had to remind myself occasionally to not use names when pointing out frownie behaviour. 6. I am going to have to talk with my teacher aids and explain to them that this is a different type of classroom. I may even give them some light WBT reading to do. They are not in the mind-frame of practice, practice, practice like I am. They look at me when students aren't sent back to their desks from the carpet for misbehaving. 7. I have had students sit out of an earned learning game - partly due to second guessing myself, aid comments, and the desire to have that student understand that what they were doing was not acceptable. Really, each student is part of the class and if the class won the Scoreboard then the entire class should be allowed to partake in the reward. Still, I think students need to get the idea early that what they are doing is not acceptable. 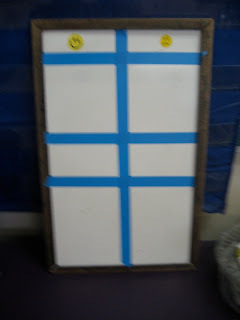 Do I give a student who is causing all the frownies a consequence even if the class wins the Scoreboard? My initial thought says no because right now that child is still practicing. My instinct says that child knows he/she is breaking the rules and, therefore needs a consequence. What I really need to focus on is the class giving the consequence - peer pressure is the key - when I call out Rule 2 - the whole class needs to say it and really mean it! 8. Line check has worked wonders on my line up!! Thanks to Educ8rKP who wrote about this on the forum!! Very helpful! "1. Laser-straight: the tiles on the floor help a lot, but we also have lines painted on our sidewalks. They know, because I remind them often, to make sure their left foot is on the line. I teach these four expectations, and slowly wean them off me reminding them of each one when we line up, and settle for the aforementioned "LINE CHECK!" They repeat "LINE CHECK!" and instantly snap to attention in a perfect, orderly, OCD-tickling line (tears of joy!). The key is consistency and unbending, unwavering expectation of perfection. As long as it's not perfect, we don't move. If we're already moving and it stops being perfect (arms swing out, someone talks, someone veers way out of line), I call "FREEZE!" and everyone stops. I say "LINE CHECK! ", they respond appropriately, then we're on our way." 1. Change my challenging students, to fence sitters, fence-sitters to go-alongs and my go-alongs to alphas. 2. To talk less and use Teach/Okay! more. Making your own Power Pix? At the Phoenix conference we practiced making our own Power Pix. 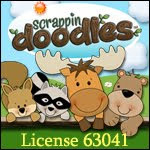 Some teachers shared this site that provides kid friendly definitions for different terms. Thanks Phoenix teachers!! 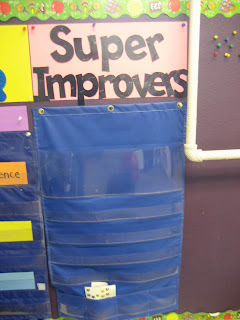 So here is Andrea Schindler's document for starting Kinder adjusted for First Grade! Continue to teach one 5 Step Lesson a day - try to make them short as it is the beginning of the year. 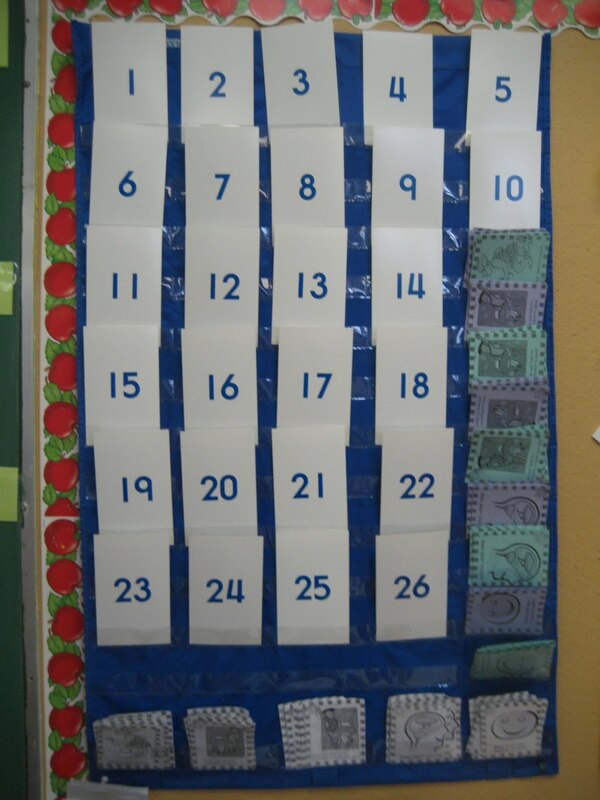 Weekly Stars (When students get 10 stars, which usually takes about a week, they earn a special reward, like a five minute game of Mind Soccer). Begin teaching two Five Step Lessons plans per day. You may even increase this to 3 or 4. *Once students are comfortable with “Teach! Okay!” add in the "Switch!" *Once students are comfortable with "Switch!" add in "Tag Team"
*Once students are comfortable with the “Teach! Okay!”, teach the students the Crazy Professor Reading Game. New to WBT? Here is how! When I first began Whole Brain Teaching I didn't have the luxury of going to a conference, even though they are free:) So I began by using several different resources that WBT has to offer. 1. I began by watching all of the videos on youtube.com - I am primarily a visual learner so I watched them over and over gain, especially Andrea Schindler's Kindergarten video. Every time I watched it I saw new strategies! 2. I practiced in the mirror and with my sister. Basically, I taught a lesson with my sister and she played the role of the student. This was very helpful as it helped me utilize the words and it allowed me to practice out-loud so I could find the right order and rhythm. Also, it was a lot of fun for both of us. 3. I read all of the free e-books available on the website. Yes, it was a lot of reading but the stories and techniques are so good that it went by really fast!!! 4. I began reading all previous and new posts on the forum. I found these very helpful and useful for solving problems in the classroom. 5. I began signing up for weekly free webinars with Chris Biffle on Thursday nights. These particular sessions went through the Big 7 and gave me a clear visual, as well as different variations for using them in the classroom. Look for future webinars offered by WBT. 6. Then, I logged in to attend the free Livestream chat sessions on Saturday mornings given by Chris Biffle on the Brain Toys. This was amazing because I could participate with comments and suggestions. Look for future Livestream sessions offered by WBT. 7. Finally, I attended the conference in Phoenix. This really helped to fine tune the little things although I did find out that I was doing most of the techniques correctly! Oh yeah! Furthermore, it was wonderful to meet and talk to all the passionate teachers in Phoenix. Those kids are sure to be blown away by everything you bring to the table on a daily basis! May Whole Brain Teaching inspire you in your teaching. Questions, comments, and concerns are vehemently welcomed as you weave WBT into your daily teaching. 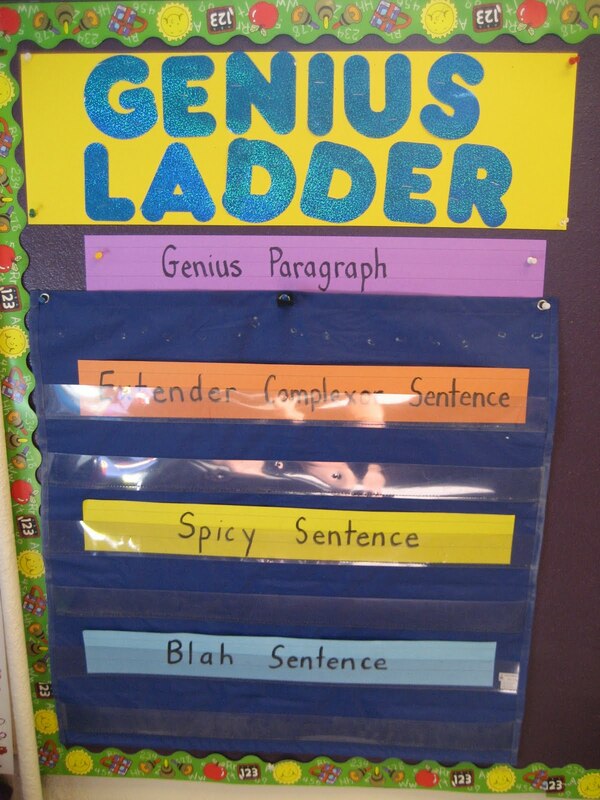 This weekend, the Genius Ladder, inspired my teaching. I will be using it daily with my students this year to help improve their writing. Oh yeah! See the forum at www.wholebrainteaching.com for more on this cutting-edge WBT concept. Also, tune into my blog for a future post tentatively titled, "New to WBT? Here is how!" So I have been away from my computer awhile traveling and visiting - lots of people have brought up Whole Brain Teaching to me! Everyone seems to be very positive about the whole concept. Some can't wait to try it. I have also met a few up and coming teachers who I have eagerly shared the concept and methods with. They were very responsive! Hope they try it out! Happy teaching/summer/planning all!! Off to Phoenix on Sunday for my very first face to face conference!! Oh yeah!!! What can I say but that making a WBT video is TOUGH, yet rewarding! A rolling grand salami to all the expert WBT teachers out there who have put out a video! 2. Prep your students. Teach them to ignore the camera/computer. This is EXTREMELY tempting for them and has resulted in some hilarious outtakes that I laughed myself silly over in private. Also, the more you film, the less they notice. 3. Think about which students are going to be pulled out of the classroom and at what time. Plan to film accordingly to avoid interruptions. 4. Challenge students to be good leaders and reward the ones who perform with spots on camera. Pump your students up with positive reinforcements. 5. 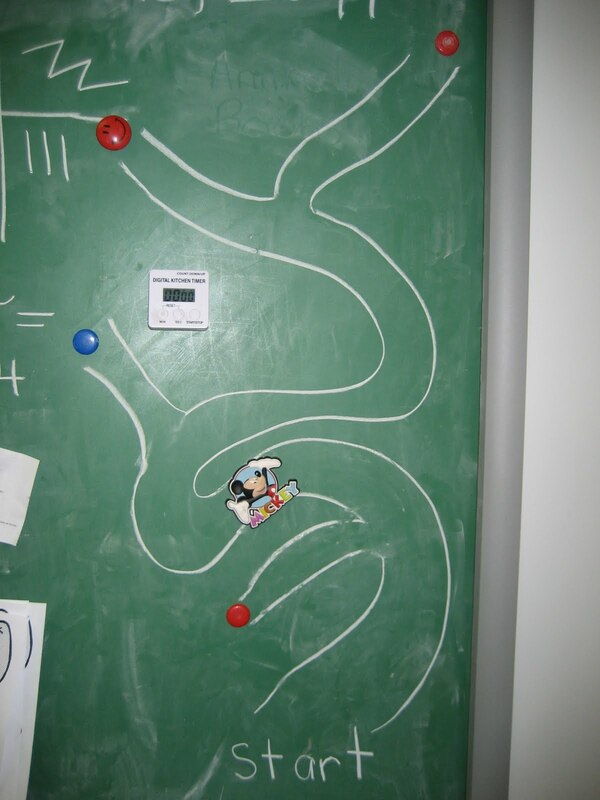 Create a "Do Not Disturb" sign for your classroom. This will save you from inopportune interruptions. 6. Film a lesson you have already given previously, especially if you are relatively new to WBT and the power pix. You and the kids will feel more prepared and will give a better performance. 7. Repeat yourself at least three times while students mirror your gestures, followed by mirrors and words. They say that you need at least three repetitions to learn something. I have noticed that it takes three times before all of my students are mirroring my words and gestures. It just takes some students awhile to put everything together. 8. Teach students to talk, not yell at one another. Review the actions of a good teacher. A good teacher turns to their neighbour, speaks clearly, and helps with big gestures. 9. Give time for students to finish their thoughts before cuing them to teach their partners. Allow time to pass before saying Switch! A lot of my students rely on each other to lead them in the right direction with the wording. Several students take a second or so to gather their thoughts. 10. Finally, emphasize focus. I have found that moving the class from Class to Team to Winners to Champions is an amazing tool to increase focus for even my most distractable! During filming today, we were comparing and contrasting the less than/more than symbol and the equal sign. One student did an excellent job with his partner so I called him up to teach the class. At first he claimed he did not know what to say. I coaxed him up there. Only as he started did I realize how nervous he was!!! I guided him through it and he did a great job yet I could visibly see how hard it had been for him. Previously, I had wondered if he was just resistant to participating. My eyes were opened to just how much confidence and skill it takes for students to teach the class. I was so proud of him. What wonderful skills we are giving our students by using WBT. One more thing: I LOVE, LOVE, LOVE the assessment part of WBT. Yes! No Way!, Cutie! and the final written assessment (I have been using recipe cards.) give me such a great quick and easy picture of who has mastered the concept and who still needs help! Can I get an OH YEAH!! Quiet on set! It's show time!! So the scoreboard turnover to students continued this week. As the interest grew, I started to have the class vote on who they thought were excellent leaders and teachers. I chose one for the scoreboard and two for other leadership jobs (calling students to the carpet, etc.). I LOVED giving the scoreboard job out to a student as I was not forever searching for a pen. I would just say, "I think the class deserves a smilie for that!" and my student leader would say, "Wait for it!" to which the class responded, "Oh yeah!" During Library, we read a book about the digestive system and students initiated a discussion comparing and contrasting plant stems and blood vessels. Students stood up and taught the class their higher level thinking connections!! I taught a lesson on expanded form after watching Farrah Shipley's amazing video on compound words. To help I had a slide on the SmartBoard for each section of the lesson: the rules, the power pict, examples, non-examples, Yes/No Way!, Cutie, Critical Thinking, written work questions to be completed in a notebook or on a recipe card. 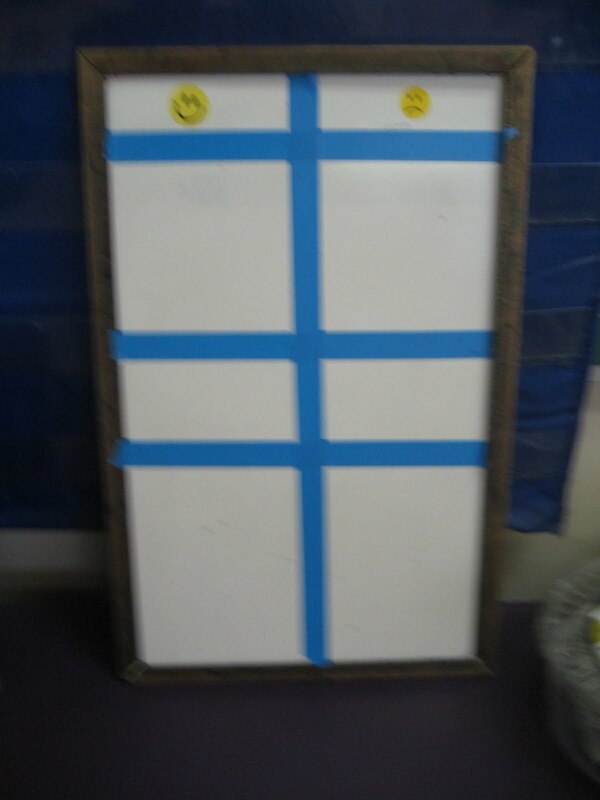 I added a target bullseye to discuss and provide class and teacher objectives near the beginning. It worked really well and the lesson had better flow. Next time I want to have a clipboard so that I can assess and record student learning during Cutie. In other news, I started saying, "Quiet on set!" when Sharing time was about to begin ~ I borrowed this from another post on the forum. The class responds, "It's show time!" Way fun! Also, we did an animal unit this week. Each student wrote a report about their chosen animal after reading a book and writing down four fact words and an opinion word about their animal. I demonstrated how to gesture through the title and each of the sentences created from the collected words. Then, I had the students return to their desks to silently make up and gesture through their own sentences using uppercase letters and periods at the end. Next, using the Teach/OK, they practiced saying and gesturing their sentences with their partner. Finally, they wrote down their prepared sentences. In the end, they produced fantastic reports with beautiful complete sentences!! OH YEAH!!! The week ended with a field trip a golf course to learn about our community The Class/Yes! and the rules were well utilized (although silently with hand gestures by me due to golf course rules:). The parents and golf course staff were extremely impressed with my students' manners. Phew! I think it's time for a vacation! This week, after reading Deb Weigel's blog, I was inspired and challenged my class to move from Class to Team to Winners to Champions just as Chris Biffle suggested during the live broadcast last Saturday. I wrote all four words on the chalk board and I put a magnet beside Class. When everyone was very focused and gave me their full attention immediately I moved the magnet down to Team, etc. It worked really well to help and focus my class. For the first time I felt like I had everyone's complete attention - before there was always a few stragglers who were off in their own world!! It was so nice to see them really engaged quickly! We never did make it to Champions but we did make it to Winners a few times. I want to make it last as long as possible:) Thank you Chris Biffle for the GREAT idea!!! Also, we have been focusing on speaking and writing in complete sentences for the past two weeks. The results are starting to make an appearance. I had three students write amazing stories this week during Work on Writing time. The sentences were not run-ons and for the most part started with upper case letters and ended with punctuation!!! OH YEAH! Today my class hosted Muffins with Mom as a thank you tea party. It was so wonderful having parents in and being able to get the kids attention so easily. I had the kids teach their parents about adjectives and they had to use an example popper sentence to describe their moms! It was so cute! One last thing - one of my students who has really shined in the last few months wanted to be in charge of the scoreboard. I let him and he did an awesome job for me during each lesson! P.S. For smilies we are saying "Sweet!" and for frownies we are saying "Oh rats!!" Hi all! I am so excited! I just booked my flight to Phoenix for the July 18-21 WBT Conference!! Anyone want to share a hotel room? I heard my vice principal use the Class/Yes with her students today:) Oh yeah!!! Sorry I haven't posted in awhile but the internet was not working - now I am back! Also, this week was our primary concert so it has been very busy!! Today we had our regular cross-country running practice after school. I usually ride on the bus with the kids to the park. Now all of you who have been on a bus know what it is like! For those of you who don't, imagine 60 kids being very loud, standing up and down, for 15 minutes. I decided to give WBT a shot. Before you know it I had fourth graders all the way up to seventh graders listening and following cues. I taught the Class/Yes (I changed it to Team/Yes, Coach) and Oh Yeah within in seconds. Then I got them to mirror while I talked about the rules of the bus. It worked rather well. If someone stood up they got a Mighty Groan and when they sat down they got an Oh Yeah. Then, we arrived at the park and another teacher was running the warm-up. The kids were having a hard time listening and focusing. I asked her if I could try something we had just learned on the bus. I got all of their attention and handed it back over to her. She tried it and it worked for her too! Oh yeah, for WBT! If I'm being honest...I am still tired some days but I am so HAPPY! The relief I feel that I have a behaviour plan that works is so satisfying and comforting. There are steps to follow and a Plan B if Plan A doesn't work. My students are engaged, involved and excited about school and learning. My stress level is WAY lower. We laugh more as a class and we play all day as we learn. To sum up, I would say I use less energy with WBT than I did previously due to the worrying and, yes, frustration I would experience on those days when my class was especially energetic. Now, their energy is put into our learning. What more could I ask for? P.S. When I am super tired, my student leaders run the classroom! Can I get an OH YEAH for student leadership!! Hello fellow teachers and readers!! So I have been practicing Whole Brain Teaching in my classroom for a year now and it just keeps on getting better and better. I will try and blog everything about my attempts at Whole Brain Teaching in my classroom. My plan for May is to have my students answer in complete sentences, using adders, because slappers, examples poppers, and concluders - all of the wonderful brain toys we learned about this morning on the live webcast by our own dear Chris Biffle! I am super excited! The grade 2 teachers won't know what hit them!! !